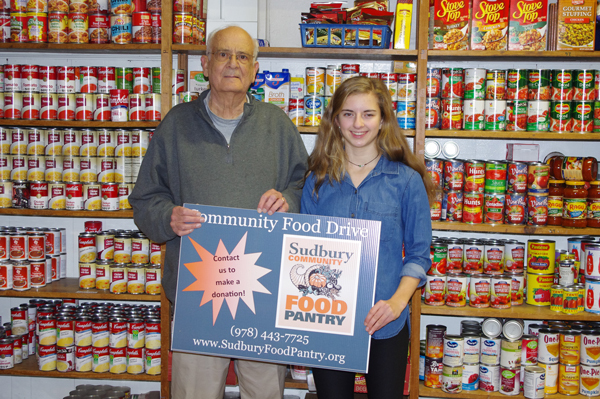 Natalie Turkington, a freshman at Lincoln-Sudbury Regional High School, delivered approximately 750 pounds of food to the Sudbury Community Food Pantry during the holiday season. Natalie, partnered with sophomore Madison Walsh who organized a similar collection last year, as well as the Curtis Angels, a community service group at the Curtis Middle School. Turkington and Walsh held collection drives within their neighborhoods. The Curtis Angels engaged the middle school community and social media was used to reach the broader Sudbury community. Natalie is an ambassador with Project 351. Project 351 is a nonprofit organization that unites one eighth-grade service ambassador from every city and town in Massachusetts for a year of community service and leadership training. She was chosen to represent Sudbury in January 2016, and since that time has organized many community service projects including the food drive. “I knew the Food Pantry had numerous supporters including the elementary schools, but when I learned how many people in our own town and surrounding towns needed food, I knew I had to step in. With the guidance of Project 351, and the help of Madison and the Curtis Angels, I was able to make a huge impact in helping the many families in need through the holidays,” said Turkington. Turkington, along with Walsh, was chosen to be a member of the Alumni Leadership Team for Project 351, where she will help lead a new group of ambassadors through their year of service. The pantry’s sole purpose is to help any family, or individual in need, and no one has ever been turned away from the Food Pantry. Because coming to strangers and asking for food can be difficult, an effort is made to put all clients at ease while they wait to be served. The food pantry is an all-volunteer organization. As a member of the Greater Boston Food Bank, and its purchasing power, the Sudbury Food Pantry is able to purchase food and personal care items well below wholesale prices. The Sudbury Food Pantry purchases food from local supermarkets when needed and is a distribution site for the USDA food assistance program and the Massachusetts Emergency Food Assistance Program. The pantry is open from noon to 2:30 p.m. Tuesdays and Thursdays. Sudbury residents may come twice a month and non-Sudbury once a month. It is located in the basement of Our Lady of Fatima Church, at the intersection of Union Avenue and Concord Road. 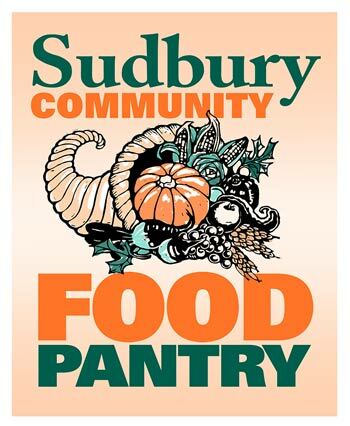 The mailing address is Sudbury Community Food Pantry, P.O. Box 751, Sudbury, MA 01776.